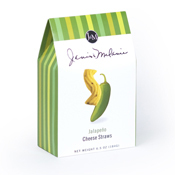 South-of-the-border spice gives Jalapeño Cheese Straws the perfect kick! Not a cookie, not a cracker, but a savory, crisp baked treat, you'll enjoy them in so many ways. Serve with icy cold beer or margaritas, or crumble over chilled gazpacho. You'll love them as a snack straight from the box, too! 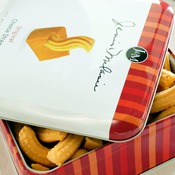 J&M Foods proudly continues its family tradition of providing their customers with the best tasting cookies and cheese straws on the market. All of their products are trans fat free, made from only the finest natural ingredients and are baked with care. And, in keeping with a 100 year old family recipe that inspired their great tasting Original Cheese Straw, they continue to introduce new products to keep their customers coming back for more. Founded over 20 years ago by Jamie Parham with the help of daughters Janis and Melanie, the company continues to be driven by a passion for good food.